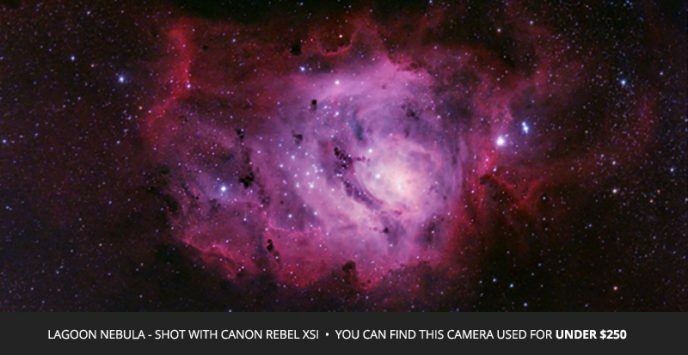 The very first camera I used for astrophotography was an old Canon Rebel Xsi (450D) DSLR. Even though the production of this camera was discontinued many years ago, I still use and enjoy this camera today. 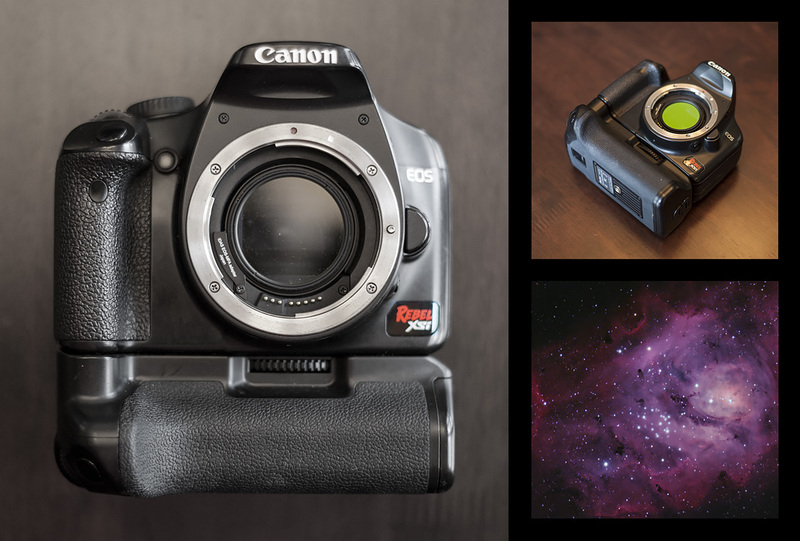 A DSLR camera like the Canon Rebel 450D is a versatile choice as it can easily be attached to a telescope for deep sky imaging using a T-Ring and adapter. You can also use this camera with fantastic camera lenses such as the Rokinon 14mm F/2.8 for wide-angle nightscapes and Milky Way photography. I’ve used many types of cameras for astrophotography from monochrome CMOS imaging cameras to cooled one-shot-color models. My Canon Rebel DSLR’s continue to produce amazing images, and they are one of the best ways to get started in the hobby. I eventually upgraded my DSLR camera to a (slightly) newer Canon EOS Rebel T3i (600D), and it came pre-modified for astrophotography. 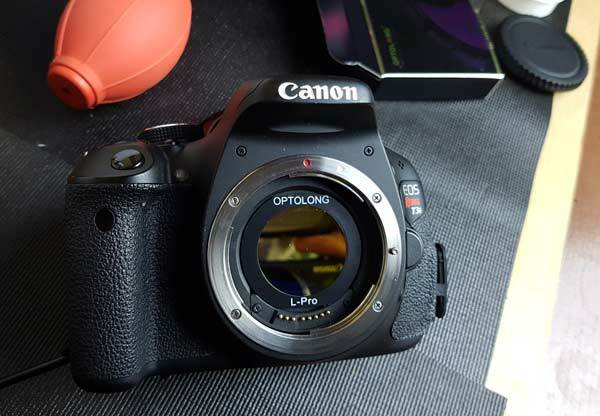 The modification that was made to this camera is known as the “full spectrum modification”, which involved removing the stock IR cut filter inside the camera body. Although there are many choices to consider when it comes to choosing a camera for astrophotography, an entry-level Canon Rebel series DSLR offers a unique combination of value and performance. In this post, I’ll share my personal results using the Canon Xsi DSLR for astrophotography, and give you my recommendations for a beginner DSLR camera. The moon’s glaring presence has subsided, and it is now time to gather more RGB (color) light frames on my coveted summer deep-sky milky way objects. This is now my 5th summer as an amateur astrophotographer, and I don’t like to waste time when choosing my target for the night. During the months of May-July, the Messier objects located near the core of the Milky Way have my full attention. 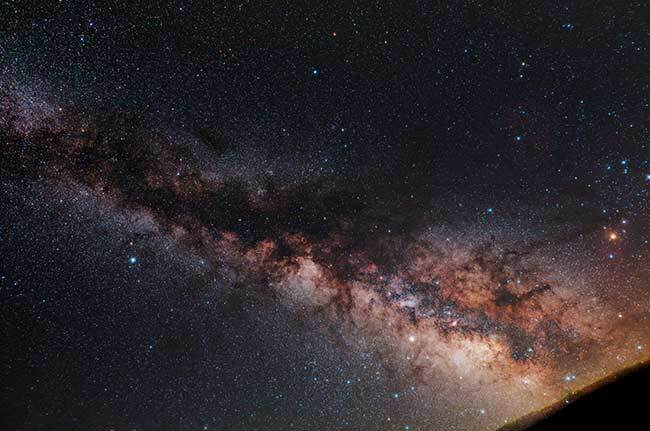 My favorite summer deep-sky objects lie within the Sagittarius region of the Milky Way Core. Many of them are bright and colorful such as the Lagoon Nebula, Eagle Nebula, and the Swan Nebula. The Lagoon Nebula is one of my all-time favorite targets and a worthy photo opportunity for any DSLR camera and telescope. The summer emission nebulae in Sagittarius are so bright, it is possible to photograph them from a light polluted area such as your backyard in the city. My backyard skies are rated a Class 8 on the Bortle Scale. 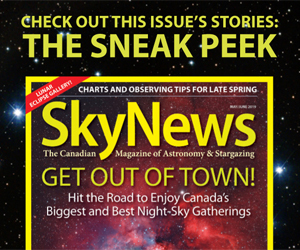 From my latitude in the Northern Hemisphere (Ontario, Canada), the main aspect to consider is having a clear window of sky to the South, as most of the summer Milky Way targets travel Southeast to Southwest throughout the night. 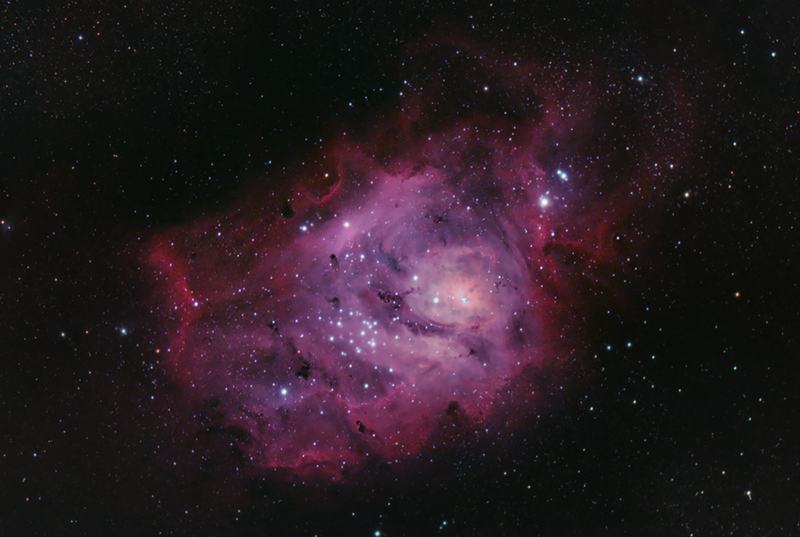 The photo of the Lagoon Nebula above was imaged over several nights last week. I set up my telescope gear on June 30th, July 2nd, and July 3rd over the Canada-Day long weekend in my backyard. It’s rare that we have such a long stretch of clear nights, especially on a long weekend. This colorful nebula does not rise very high in the sky from my latitude in Southern Ontario. In fact, it just barely clears the height of my backyard fence. When planning a deep sky imaging session, it’s important to have a clear view of your target for an extended period of time. I consider myself very lucky to be able to photograph such a glorious night-sky treasure from home. You can view the specific photography details for my final image on my Flickr profile. I also managed to squeeze in some more imaging time on the Eagle Nebula, as well as the Elephant’s Trunk Nebula over the weekend, as you will see further down the post. I have photographed many galaxies with my Canon EOS Rebel Xsi from the backyard. One of my most successful images was the Triangulum Galaxy. 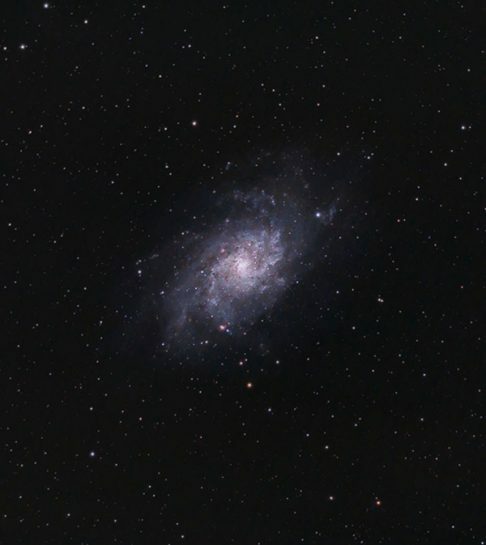 A long stretch of clear nights allowed me to collect over 7 hours of exposure time on M33. This is a diffuse deep sky object which can make it difficult to observe visually, but through photography, we can reveal the beautiful structure and color of this galaxy. The telescope used to capture the image below was an Explore Scientific ED80 with a focal length of 480mm. You can view the equipment I use to take images like the ones on this website here or watch this video as I take you through my complete setup for astrophotography. 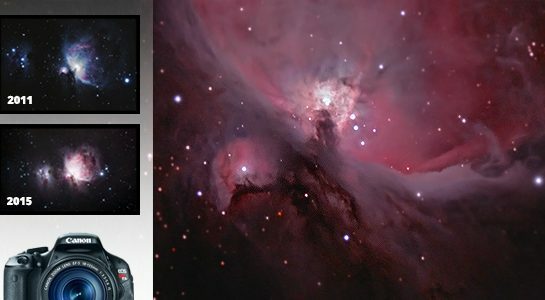 If you already own a DSLR and telescope and have started taking your own astrophotos – you may benefit from my astrophotography tutorials about image processing. I connect my Canon Rebel DSLR to my laptop computer using a USB cable and control the camera through a software application known as BackyardEOS. With this application, I can tell my DSLR to take multiple exposures of varying lengths and ISO settings. I can also use this program to focus the stars, and make sure that my astrophotography subject is in the center of the frame. A typical session in my backyard will last all night long and have my Canon Xsi set to take anywhere from 30-60 three to four-minute exposures on a nebula or galaxy. Dark frames of the same temperature are also captured during the night to reduce noise in the final image. As a general rule of thumb, the colder your digital camera is while imaging, the better! Long-exposures taken during a hot summer night will produce even more noise than usual. 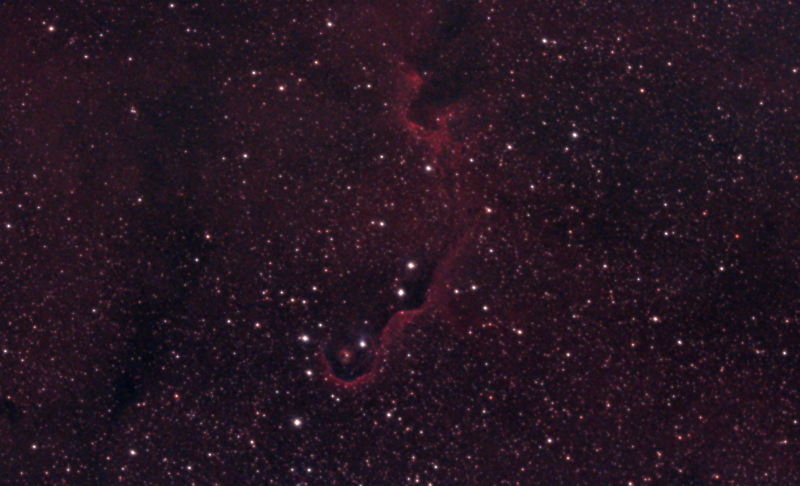 On a recent attempt to gather some H-alpha data on the Elephant’s Trunk Nebula, I discovered the limits of my DSLR when imaging in the hot summer heat. On this particular night in Mid-June, the temperature remained over 30° well after midnight. The hot hazy skies, combined with a dangerously hot sensor produced a red, noisy mess of an image. An exposure of 30 seconds to a minute may be fine in this heat, but I was shooting 7-minute subs at ISO 1600 to pick up faint nebulosity through a narrowband 12nm Ha filter. Lesson learned! I have since returned to the Elephant’s trunk nebula in the constellation Cepheus, and let me tell you – it is faint! Photographing IC 1396 from a light-polluted backyard in the city has proved to be quite the challenge. I was able to capture about 2 hours of exposure on this nebula last week, which is not enough to produce a pleasing image. I have stood behind the Canon brand of DSLR’s from the beginning. Based on the advice I read in the Backyard Astronomers Guide back in 2010, I chose to start my photography adventure using Canon digital cameras. At the time, they were the clear choice for astrophotographers, offering the only DSLR built for astrophotograpy (They later released the 60Da) Nikon has come a along way since then in the way of astrophotography, but my heart still belongs to Canon. In 2015 I upgraded to Canon EOS Rebel T3i camera for astrophotography. 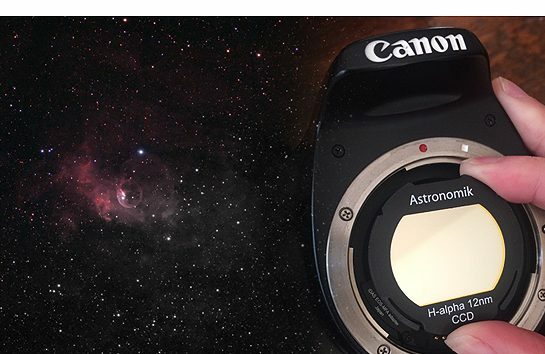 The T3i (600D) came pre-modified by an astro-modification service known as “Astro-Mod Canada”. I have used this camera to capture many deep sky objects using various clip-in filters. This is the DSLR I always recommend to beginners. First of all, it is the successor to the Canon Xsi which I use now, and can provide actual results (my photo gallery) of the astrophotography performance of this camera. Second, it is a great value. You will find used models of this camera body at online retailers (such as Henry’s in Canada) for a fraction of the price of a new CCD Astronomy Camera. 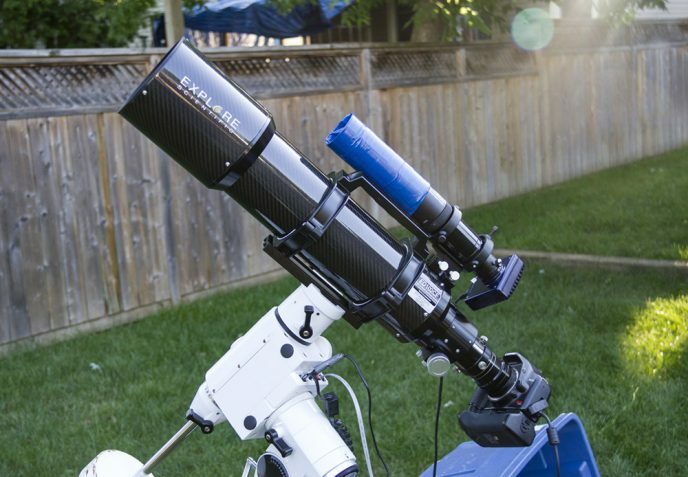 You can no longer purchase this camera new, so if you can’t find a used body at camera retailers, you will have to search online forums such as Canada Wide Astronomy Buy and Sell, or Astromart. This camera can also quite easily be modified for astrophotography by yourself or a professional. The features of the camera itself are quite standard of all models these days, but this DSLR is capable of taking astonishing deep-sky and landscape astrophotography images. My favorite feature of the T3i is the flip-out LCD screen. This comes in very handy when shooting deep sky astrophotography images because the camera is often in an awkward position when connected to a telescope. Tilting the screen to a more accessible angle allows me to focus the telescope using the 10X live-view function of the camera. I can also review the histogram, make changes to the exposure time, and review my light frames as they are being captured. The Canon T4i and T5i are also excellent choices but are a little more expensive. 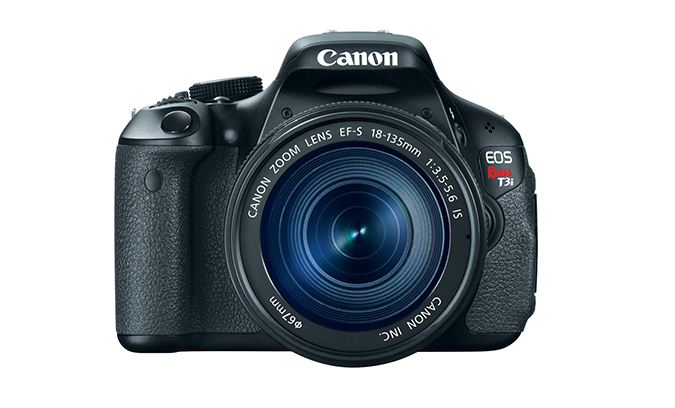 The Canon T5i can be purchased in a kit including an 18-55mm lens. I have used a wide variety of clip-in light pollution filters with my Canon Rebel DSLR cameras. For deep sky targets containing hydrogen alpha emission data such as the Eagle Nebula, a narrowband filter like the 12nm Astronomik Ha is an excellent choice. For capturing broadband RGB data on my targets, the SkyTech CLS-CCD filter allows me to block a healthy amount of city glow. This filter creates an impressive amount of contrast between your object and a light polluted sky. For broad-spectrum targets such as galaxies or reflection nebulae, I recommend trying the Optolong L-Pro filter. This multi-bandpass filter is less aggressive and helps retain the natural colors of the stars in your image. There are many different types of astrophotography cameras available, other than Digital SLR’s. Dedicated thermal-cooled CCD cameras are much better at producing deep-sky images with less noise, but are much more expensive and less user-friendly. Webcams can produce stunning images of Solar System planets and the moon and can be inexpensive and easier to use. The Altair Hypercam 183C is an example of a dedicated astronomy camera that can bridge the gap between a DSLR and a CCD. I still enjoy using a DSLR because it’s an enjoyable experience. You can’t beat the value and versatility of the Canon Rebel series cameras. 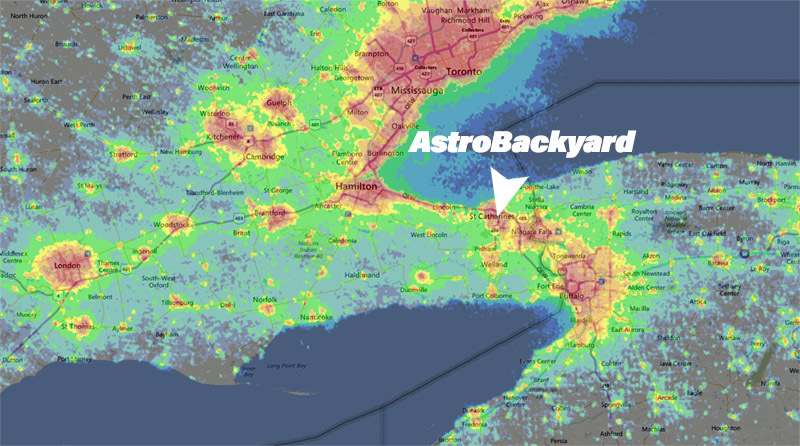 I often speak of the light pollution from my backyard in the city. I love to get away from home to image under dark skies at my astronomy club’s observatory (RASC Niagara Center) – but I rarely have time to drive 40 minutes with all of my equipment to this special place. To maximize my time under the stars, it makes more sense for me to get as much astrophotography in at home, in the backyard. (Hence the name of this website) The light pollution produced by the city I live in is quite heavy, especially in certain areas. My house is in the worst of it, being located in the central area of town. Do you see that? I am in a Red Zone! I would estimate that my location is either a class 7 or 8 on the Bortle Scale, although I have not yet taken an accurate light pollution measurement. The Bortle Scale states that a class 6 zone (NELM 5.1-5.5) will have your surroundings easily visible and that the Milky Way is visible only at the Zenith. To view all of my best images captured with a Canon Rebel Xsi and T3i, check out my photo gallery. I wish you all the best in your future astrophotography endeavors, clear skies. I did find a park called Eifel national park in Germany which is 1h30 drives away. They are almost dark sky certified. Going there end of this month, am very excited to see the difference ! Wow, you’re right that is some heavy LP! Enjoy your trip to Eifel National Park. I am sure you will notice a huge difference! Not sure it would be worth it. I just look from my garden, but can’t get lower than 30degrees due to surrounding rooves. Thinking about building an elevated pier to allow planet watching. Or just carry the gear out to the fields & up the hill for horizon to horizon viewing. Andrew. I have a similar situation, but my drive is a bit longer. In about 40 minutes I can get to a spot where the Milky Way is easily visible to the naked eye. I usually opt for staying home just because of the convenience. When I do make the trip out there, it’s a real treat. I like your elevated pier idea! !